If you browse through Pinterest or DIY blogs on the internet or even cooking tutorials on YouTube, you know about the love people have for glass jars. You might even feel the same way. Glass jars are relatively cheap and incredibly versatile. They’re used for pickling and preserves, as vases, organizers, and drinking glasses. They’re spruced up to become centerpieces or dressed down for casual cocktails. 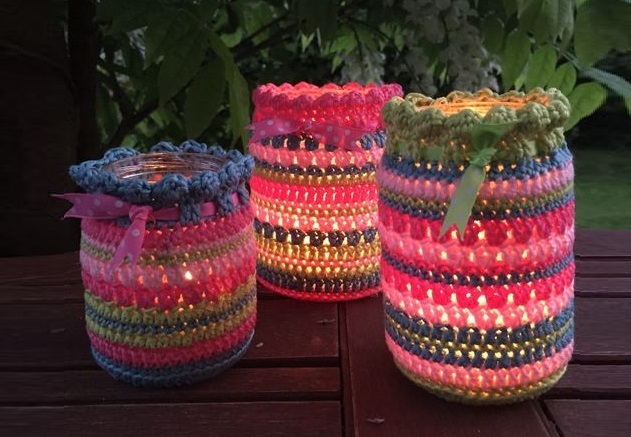 Glass jars are also used as candle holders, and with this free mason jar cover crochet pattern, you can combine your love of both glass and crochet to make a beautiful nightlight to take outside for a night on the porch or deck, or take it inside for a cozy evening. Little Monkeys Crochet has crafted an elegant free jar cover pattern for two sizes of mason jars, the 32oz and 16oz, respectively. To make either of these, you’ll need light cotton yarn (suggested: Sinfonia) and a 5mm crochet hook. Please note that the patterns use American Standard terminology and that they are both crocheted in a seamless round, which means you’ll need to use stitch markers to mark your rounds. Although this might seem a little intimidating, the patterns are labeled “Easy” and come with lots of photos to help you through. The only stitches you’ll need to know are Magic Ring, single crochet (sc), double crochet (dc), and half double crochet (hdc). 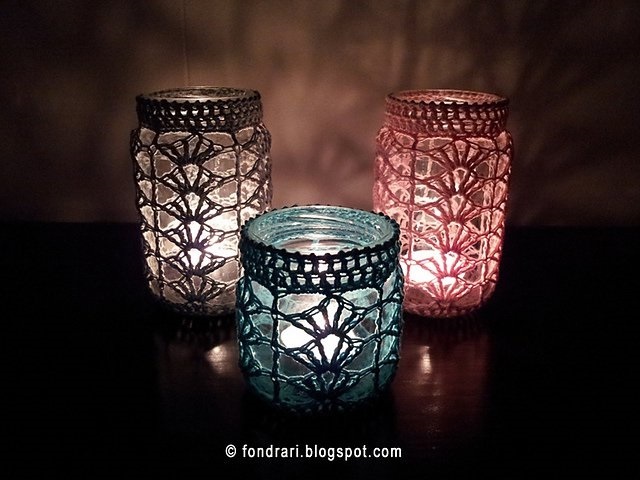 Love Crochet has also created a free jar cover pattern for the express purpose of turning jars into nightlight holders, but with a more standard crochet stitch pattern that adapts easily to any size of jar you might have on hand. The pattern calls for a 2.5mm crochet hook and cotton yarn (suggested: Rico Essentials Cotton DK), along with some ribbon to tie around the top to fit snugly around the opening. Please note that the pattern uses UK terminology. You’ll need to know the following stitches: chain (ch), slip stitch (sl st), double crochet (dc), blo (back loop only), treble crochet (tr), and half treble crochet (htr). Love Crochet’s pattern uses multiple colors, so you’ll need a few different yarns, or you can use a variegated yarn. 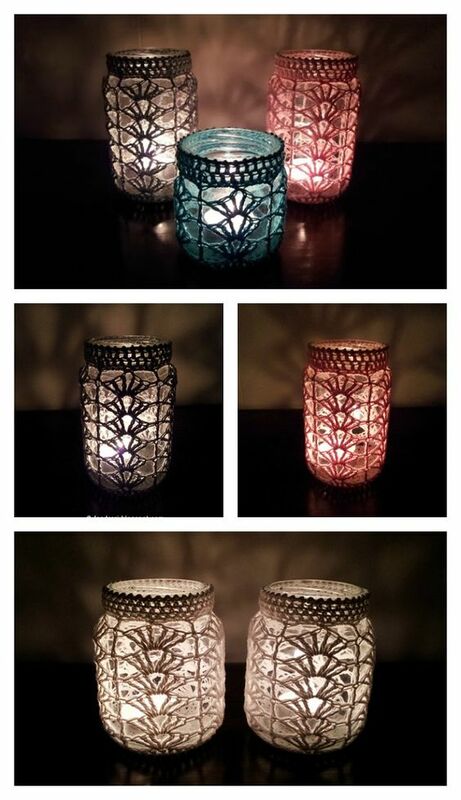 Whichever pattern you choose to use (you can always experiment with both), the end result is a unique, beautiful cover for glass jars that you can use all spring and summer while you sit outside enjoying the cool breeze as you wait for the stars to appear.